Cleveland (August 7, 2018) – Early this morning, the Northeast Ohio Regional Sewer District posted a public advisory at Edgewater Beach; the advisory was posted as a result of a combined sewer overflow (CSO) event at the beach just before midnight on Monday, August 6. This was confirmed by the Sewer District’s Sewer System Maintenance and Operations crew at 12:45 a.m. Tuesday. This overflow discharged a combination of raw sewage and stormwater into Lake Erie during last night’s heavy rain event. Visitors (particularly children, the elderly and those in ill health) are advised to avoid contact with the water and debris. Since 1972, the Sewer District has reduced the volume of combined sewer overflows from 9 billion gallons to 4.5 billion gallons. Throughout the mid-1970s, the combined sewer outfall at Edgewater Beach discharged raw sewage into Lake Erie approximately 40 to 50 times per year. However, because of the Sewer District’s improvements to aging infrastructure, the Edgewater combined sewer overflow discharges have significantly decreased. The last Edgewater discharge (during recreation season) was June 27, 2015. Project Clean Lake – the Sewer District’s 25-year, $3 billion capital improvement plan – will reduce combined sewage entering Lake Erie and other area waterways. In addition to increased capacity at the Sewer District’s three wastewater treatment plants, Project Clean Lake will include the construction of large storage tunnels designed to capture combined sewage and convey it to a treatment plant for full treatment. 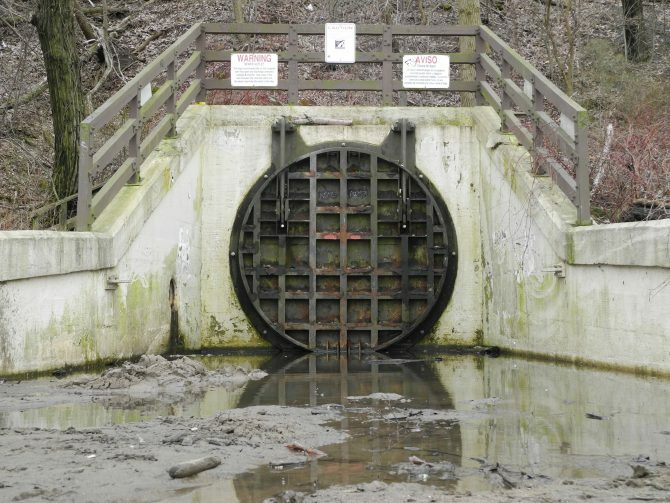 The Sewer District currently has two tunnels in operation: Euclid Creek Tunnel’s flows are treated at the Easterly Wastewater Treatment Plant and Mill Creek Tunnel’s flows are treated at the Southerly Wastewater Treatment Plant. Three additional tunnels – Dugway Storage Tunnel, Dean Valley Tunnel and Westerly Storage Tunnel – are currently under construction. Other midwest cities with similar combined sewer infrastructure are addressing CSO issues as well.